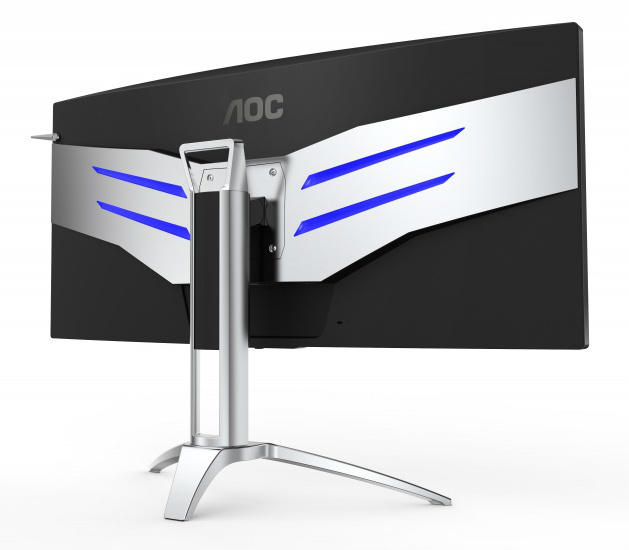 AOC has just announced its new gaming monitor behemoth: the AG352QCX. This is AOC’s new addition to its line of FreeSync-enabled monitors. The AG352QCX has a massive 35” curved ultra-wide panel boasting of a native maximum refresh rate of 200Hz, the highest in the industry. Before this monitor, 120/144Hz was the industry standard. This translates to better overall gameplay and buttery-smooth transitions between frames. The high refresh rate is made possible by the monitor’s use of an MVA (Multi-Domain Vertical Alignment) Panel. Most panels used in other monitors are TN (Twisted Nematic) because they are inexpensive and offer higher resolution rates. The trade-off, of course, is higher refresh rates. If you are a professional gamer, who require only the fastest in the arena, this monitor should easily be in your crosshairs. On to the standard stuff: the AG352QCX has a maximum resolution of 2560×1080 and an aspect ratio of 21:9. Brightness is set at 300cd/m2 and a response time of 4ms GTG. It also has a dynamic contrast ratio of 50 million to 1 and a static contrast ratio of 2000:1. The AG352QCX also has a pixel pitch of 0.32025 and wide viewing angle of 178 degrees vertical and horizontal. The AG352QCX has a beautiful 2000mm curve radius, which is easy on the eyes wherever you look. As with curved monitors, this enhances the gaming experience by giving you more immersion into the content. 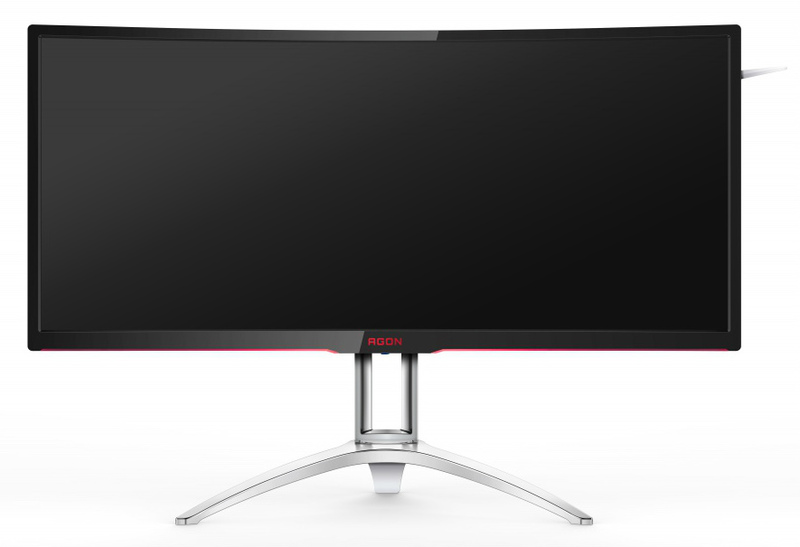 The monitor has a pure black facade on its curved panel with a blood red AGON logo beneath the screen suggesting this monitor is a gaming monster. It has a high gloss bezel covering the VA panel which strikingly tapers off on the AGON logo. It also comes with a very sturdy yet elegant curved metal base. The base is then connected to a standard VESA mount which is also silver in color continuing to a silver and wing-like shape along the monitor’s back panel. Personally, I think this is a very nice touch as if the monitor appears to be aerodynamic. The monitor does not pivot, like most curved panels. The monitor can swivel from -30 to +30, tilt from -5.5 to +29, and adjust its height to 120mm to make sure that you have the optimum viewing position possible.The monitor is available in black/red, black/teal, and black/indigo color combination variants. The monitor is available in black/red, black/teal, and black/indigo color combination variants. The AG352QCX offers multiple connectivity options on its back, as any respectable gaming monitor does. D-Sub, HDMI 2.0, DisplayPort 1.2a, and of course standard DVI connectors are available. The monitor also has a built-in USB 3.0 hub inclusive of two USB 3.0 ports ready for any USB peripherals you have on your desk. MHL also comes available on this model. The monitor also comes with a two 5W speakers. All connectivity cables are provided out of the box by AOC. People looking for a big monitor will not be disappointed with the AG352QCX. With its beautiful 35” curved display and the fastest refresh rate, any serious gamer will agree with me that this monitor is a game-changer. 200Hz is by no means a small feat especially for professional gamers and eSports enthusiasts alike. Any improvement in speed, even incremental enhancements can spell the difference between victory and defeat. Even the average gamer will surely be able to appreciate the difference compared to other monitors. With its lightning fast speed and striking curved design, this monitor is surely a very significant and welcome addition to your gaming rig.